So I’m scooting through the V&A museum, Kensington, on a schedule. I only have an hour, max, and I am on the equivalent of an insane cultural trolley dash. Must take in my favourite stuff, of course; a bit of Leonardo, Some ancient locks and keys, a tomb or two. And I’m practising that “I’m not running” frantic glide I learnt in the corridors of convent school conning nuns, when I come face to face with this man. And I skid, like a choirboy caught sprinting for evensong, to a halt under that level gaze. 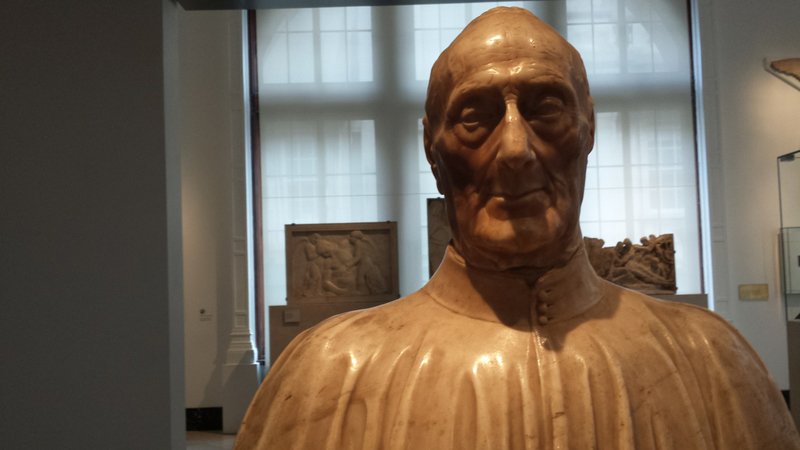 How deeply unsettling that he can gaze through marble, though he died in 1462. His name is Giovanni Chellini, and he was a lecturer and doctor at the University of Florence. He was Donatello’s doctor. His bust was made around six years before he died, by the Florence sculptor Antonio Rosselino. The artist used a life mask to cast his face; and such an immediate method of collecting a face brings the man into the hall with me on this Monday afternoon. Every fold, every line life has worn on his face is there for us to see. The way his decisions sculpted his face in life are preserved in death. He has, in some way, achieved immortality. His gaze is by no means stern; it has something of the benign about it; but there’s something else. Something I couldn’t put my finger on. Something familiar. It was not until this evening. ten or so days after my visit, that I could identify who the fifteenth century cordial professor reminded me of so strongly. I don’t know why. But for me, having met the academic in the marble, so to speak, there is something in the gaze which is the same as Grant Wood’s American Gothic. Not unkind, but austere. Not malevolent, but no less unsettling for all that. Posted in Places to visitTagged art, Britain, Donatello, england, Florence, Medicaeval, sculpture, Victoria and Albert MuseumBookmark the permalink. I see the similarity, Kate. Downright spooky, really. Gave me the heebie jeebies, I can tell you. Hope those feet are holding up. More than half way there now. All the best. That gaze and bridge of the nose. What a realistic sculpture. Great observation: “…his decisions sculpted his face in life..” Nicely said. And to you! Yes, not an easy move to do n stilettos. I see what you mean, Kate. Now if only we had timelapse art too, so we could pick up on the mannerisms of the two of them to see if there was a match there as well! 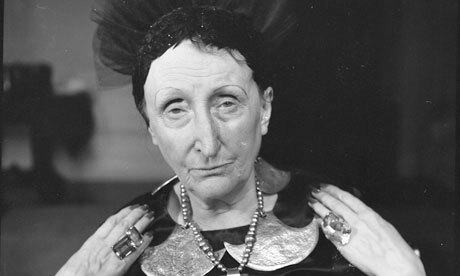 For me, I look at that cadaverous face and patrician nose and I see … Dame Edith Sitwell. Yes! Twin sons of different artists! 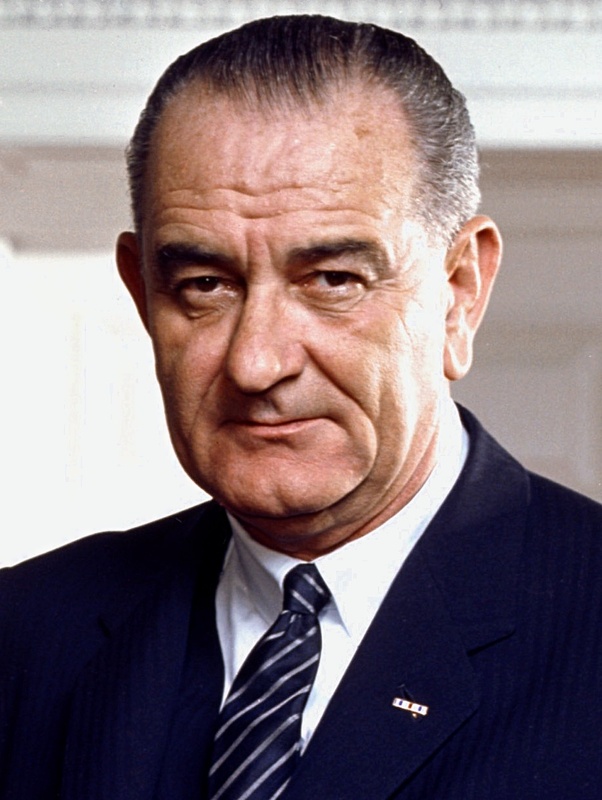 The first impression that popped into my head was Lyndon Baines Johnson. ???? And why not, I’m sure that Chellini spent many a day under vaulted gothic columns of one cathedral or another, perhaps a college or two? I am sure he feels very much at home there at the V&A, Rafael! There is a startling resemblance in the gaze! I bit spooky if you ask me. Yes. And there was no-one in the gallery when I was there, Jas. I could have done with a couple of people to keep me company! Austere. There is definitely a gravity about the expression, isn’t there, and at the same time a lightness – like he carries a lot of weight, but is well practised at the carrying. Quite a political player, I imagine, Bronwyn. Astute. What a great marble piece, yet, I’m mostly interested in learning that runnning without running technique you’ve seemed to have perfected. Do you give lessons? Do I have to practice with a book on my head? You do, Barb. It helps to have a few terrifying nuns for practice purposes and be late for a lesson or two. It takes years of practice. But when perfected, it’s worth it. The yellowing marble makes the sculpture look remarkably lifelike! It does contribute towards the overall effect, Madhu, doesn’t it? 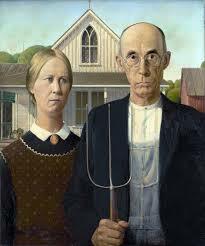 Hmmmm – will remember this next I see Grant Wood’ s Gothic at Art Institute of Chicago. Fascinating, Kate. He reminds me quite a bit of Peter Cushing in his role as Grand Moff Tarkin on Star Wars.